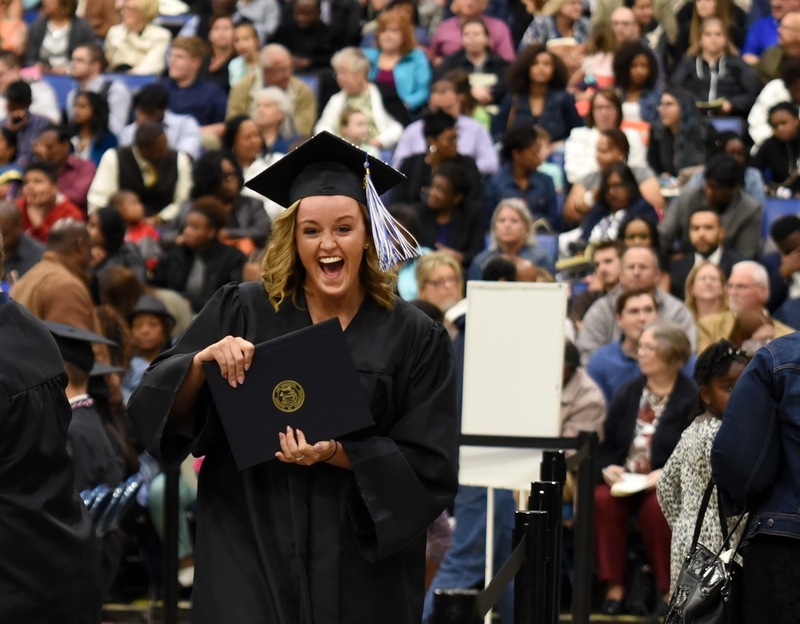 The University of Illinois Springfield held its 45th Commencement ceremony on May 14, 2016 at the Prairie Capital Convention Center in downtown Springfield. A record 1,106 students took part in the ceremony, making it the largest commencement in the university’s history. UIS Chancellor Susan J. Koch presided over the ceremony, welcoming over 6,000 guests. She reminded graduates about the important milestone of earning a college degree. Koch also congratulated first generation college graduates and thanked family and friends for supporting their students and encouraging them to succeed. “I trust that each of you has your own ‘Leadership lived’ story as a result of your UIS experience. I am supremely confident that you will indeed make a difference in the world with your leadership,” said Koch. Koch was joined on stage by campus leaders and University of Illinois President Timothy Killeen who challenged students to “create a choir that shifts the tenor of the national discourse”. “You can do it by taking the high road. Always the high road. Think UIS, your Alma Mater, breath in and out – take that high road and replace mean-spiritedness with public-spiritedness whenever and wherever you see it – again and again and again,” said Killeen. The 2016 Commencement address was delivered by UIS alumna and Springfield native Donna Sollenberger who was part of the first graduating class of Sangamon State University, now UIS. Since 2009, she has served as Executive Vice President and Chief Executive Officer of the University of Texas Medical Branch (UTMB) Health System. She was honored with the University of Illinois Alumni Achievement Award in 2005 and named one of the Top 25 Women in Healthcare by Modern Healthcare. Sollenberger told the story of her daughter who was struggling to decide between a higher paying job in the business world or a lesser paying job at a non-profit. “I asked her which of the jobs energized her. What job ignited her passion? Which job would make her want to get out of bed every day and go to work? After all, we spend as much time at work as we do at home, if not more,” said Sollenberger. Following Sollenberger’s advice, her daughter took the non-profit job that she loved and has never looked back. She told the graduates to follow their hearts. “Do what inspires you; do what ignites the fire of your passion for life and for work. We spend too much time at work not to be passionate about what we do with our careers. Yes, money helps pay the bills, but it should not be the sole or primary reason for your decision. Your happiness and fulfillment in life matters more,” she said. The student commencement address was delivered by Robyn Nicole Crutchfield of Matteson, Ill. who graduated with a bachelor’s degree in communication. She was an active member of the student body during her years at UIS, having been involved in leadership positions with both the Black Student Union and Alternative Spring Break. Crutchfield encouraged her fellow graduates to LIVE (love, inspire, vocalize, experience) as they move forward with the rest of their lives. She told the audience to love and be compassionate in your words and actions, to inspire others by telling your story, find your voice and use it, and to go out and try something new. Finally, she told them to be proud of their education and everything they have already accomplished in their lives. University of Illinois Board of Trustee member Karen Hasara, UIS Vice Chancellor for Academic Affairs and Provost Lynn Pardie and UIS Interim Vice Chancellor for Student Affairs Clarice Ford also spoke at the ceremony.